With Windows Store Gift Card you can purchase and download applications, games and more from Windows Store on your PC with Windows 8.1 or on your mobile phone with Windows Phone 8, and even purchase games on the Xbox store. With over 100,000 titles, including applications, games, music and movies to choose from. In addition, these gift cards never expire, so it can be used whenever you want. 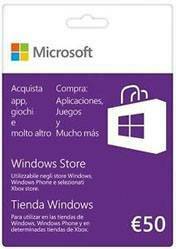 Once purchased, you will receive the activation code of the Windows Store prepaid card quickly and safely via email. Simply enter the code into your Microsoft account to unlock the corresponding credit, in this case equals 50€, in your account quickly and easily. There are no comments yet about Windows Store Gift Card 50 Euro . You can be the first one!